Event Master is a multipurpose and responsive WordPress event theme that is built to keep an online presence for any kind of events, including but not limited to conference, music, entertainment, meetup, festival, movie premiere, sport events etc. The simplicity of the theme allows it to be used for any kind of event and gives you an option to set up your site in minutes. Event Master is fully customizable. Using the powerful theme control panel on admin dashboard you can change the dozens of aspects related to functionality and design such as colors and layout of the theme. Event master is designed to display a nice layout on any device, to work with larger screens as well as tablets and smart phones. Try it out yourself! Take a look at the demo of Event Master theme and resize your browser to test its responsiveness at different sizes. With Event Master Theme, you are not limited to only a vertical category layout. We have included 5 category templates into Event Master. You will be amazed to see how easy is to set up a unique layout for categories using theme control panel and have different layouts for different categories. Besides the default style template, Event Master includes additional 4 page templates. Using those templates you can change the front page layout to a classic blog format. The archives page template will give you an option to list all entries in an archive format on a static page. We have also included left, no sidebar and default page templates resulting in a total of 5 page templates. You wont find this option available for many themes, but we have now turned it into a standard feature for all Gabfire Themes. Event Master comes with 4 nicely designed post templates. It is up to you to decide whether to use default, left sidebar, no sidebar or big picture post templates. There is also a nice image slider that can be enabled for any post template. Hundreds of icons. Event Master comes ready with 439 font icons brought to you by Font Awesome. With given options on theme control panel, you can disable sliders, enable/disable auto rotation, set number of posts and many other options. Shortcodes – need some additional styling to spice up that article, use shortcodes! Try it now at our theme playground or click here to see the demo. 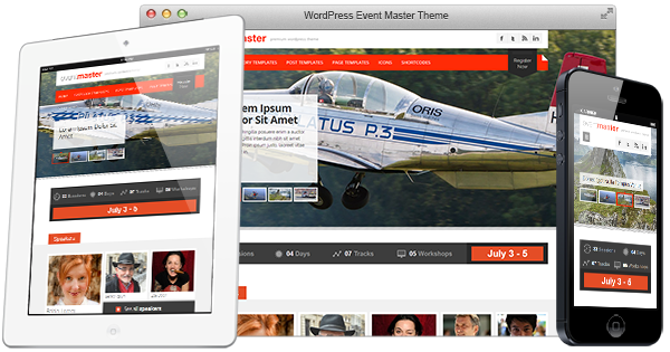 14 Responses to "Event Master – All in One WordPress Event Theme"
Like this one. This theme could power a nice crowd funding site, but I would have to tweak it a bit though. Hi There, we are glad you like our Event Master theme. Did not see a active support forum for the Event Masters Theme. Just trying to figure out how the event detail bar works? Do any of the posted event bar tags link to anything such as the events, calender or anything like that. I see on the demo that there is a register now button in the tool bar that take s you to and event bright page how does all of that work. I apologize for asking but did not see any real explanation on the demo info page nor could I find the answer my self on the demo? Sorry for the delay. Event details bar is entered on theme control panel -> event details tab. What do you mean with event bar exactly? Basically, you should create an account and start an Event at Event Bright. Get the link for that Event Registration page. Go to admin -> theme control panel -> header -> And enter the link for Register button into Register Now – Link field. The support forums topic has been created. You can now submit your questions to our support forums. yeah! this is great theme! What do you mean with event bar exactly? Basically, you should create an account and start an Event at Event Bright. event master is good theme . thanks for shring !